Wisconsin's solar industry jobs grew 45% in 2016 | Vandewalle & Associates, Inc.
FROM THE MILWAUKEE BUSINESS JOURNAL. After showing small growth between 2014 and 2015, jobs in Wisconsin’s solar industry grew 45 percent last year over 2015, according to The Solar Foundation, Washington, D.C. According to the foundation’s 2016 National Solar Jobs Census, Wisconsin’s solar industry employs about 2,800 workers across installation, manufacturing, sales and distribution, project development and related sector jobs. The census for 2015 reported about 1,900 solar industry jobs in Wisconsin. owner do when the unprotected shingles need replacing? 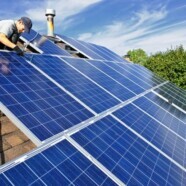 Will the solar panels be destroyed in a hail storm? A tornado? Will the cost of insuring them offset savings? Can they be added to existing roofs? Do some produce electricity while others provide hot water? Can they be paid for with PACE?